Are You Waiting for 2019? 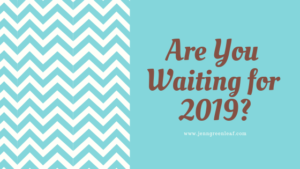 Why Are You Waiting for 2019? Looking at a blank calendar is similar to staring at a blank screen. It’s intimidating and, for some, could lead to blocks. However, if you change your mindset, this doesn’t have to occur. Take the last part of the sentence I just wrote, for example. Spin the negativity and career blocks into positive opportunities. In doing so, it will help you move forward now instead of waiting for 2019. You’ll be asking yourself why you’re waiting around for things to happen. Instead, you’ll be making changes. You’ll be proactive with your writing career. Because I’m talking about “not waiting around,” I do have plans for 2019. I’m working on them now, but many of them aren’t rolling out until January 1st. For example, I have blog posts I’m writing ahead of time and scheduling. Why is this important? Scheduling blog posts ahead of time frees me up to complete other freelance writing work and marketing. What Are My Favorite Tools So Far? Grammarly’s Premium Service: I was using their basic, but I find their premium features are well worth the investment. I’ll outline why in a future post. Hemingwayapp.com: I’m behind the curveball on this one, I’m sure. I just found out about the site this year. Two of my clients asked me to write at a lower grade level using this site. I thought it was strange but, since then, more clients have been requesting its use. Canva: here’s another I’m behind the curveball on as I just found the site this year. I’ve been experimenting with the basic service and love it so far. Instead of waiting for 2019, work on your business goals now. Your freelance writing business can thrive today. Begin by taking out a pencil and paper, brainstorm your goals, and then develop an action plan. You’ll be surprised how quickly goals develop into strategies, and plans turn in to results.